The history of trams, streetcars or trolley systems, began in early nineteenth century. It can be divided up into several discrete periods defined by the principal means of motive power used. A horse-drawn tram operated by Swansea and Mumbles Railway, 1870. Established in 1804, the railway service was the world's first. The world's first passenger train or tram was the Swansea and Mumbles Railway, in Wales, UK. The Mumbles Railway Act was passed by the British Parliament in 1804, and horse-drawn service started in 1807. The service closed in 1827, but was restarted in 1860, again using horses. It was worked by steam from 1877, and then, from 1929, by very large (106-seater) electric tramcars, until closure in 1961. The Swansea and Mumbles Railway was something of a one-off however, and no street tramway would appear in Britain until 1860 when one was built in Birkenhead by the American George Francis Train. Street railways developed in America before Europe, largely due to the poor paving of the streets in American cities which made them unsuitable for horsebuses, which were then common on the well-paved streets of European cities. Running the horsecars on rails allowed for a much smoother ride. 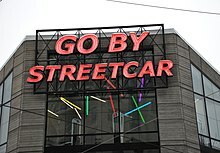 There are records of a street railway running in Baltimore as early as 1828, however the first authenticated streetcar in America, was the New York and Harlem Railroad developed by the Irish coach builder John Stephenson, in New York City which began service in the year 1832. The New York and Harlem Railroad's Fourth Avenue Line ran along the Bowery and Fourth Avenue in New York City. It was followed in 1835 by the New Orleans and Carrollton Railroad in New Orleans, Louisiana, which still operates as the St. Charles Streetcar Line. Other American cities did not follow until the 1850s, after which the "animal railway" became an increasingly common feature in the larger towns. The first permanent tram line in continental Europe was opened in Paris in 1855 by Alphonse Loubat who had previously worked on American streetcar lines. The tram was developed in numerous cities of Europe (some of the most extensive systems were found in Berlin, Budapest, Birmingham, Leningrad, Lisbon, London, Manchester, Paris). A horse-drawn tram in Sydney, 1894. The city saw the Australia's first tram service open in 1860. Problems with horsecars included the fact that any given animal could only work so many hours on a given day, had to be housed, groomed, fed and cared for day in and day out, and produced prodigious amounts of manure, which the streetcar company was charged with storing and then disposing of. 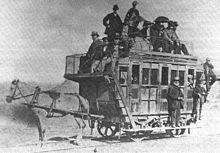 Since a typical horse pulled a streetcar for about a dozen miles a day and worked for four or five hours, many systems needed ten or more horses in stable for each horsecar. Horse-drawn trams continued to be used in New York City until 1917. Horses continued to be used for light shunting well into the 20th century, and many large metropolitan lines lasted into the early 20th century. New York City had a regular horsecar service on the Bleecker Street Line until its closure in 1917. Pittsburgh, Pennsylvania, had its Sarah Street line drawn by horses until 1923. The last regular mule-drawn cars in the US ran in Sulphur Rock, Arkansas, until 1926 and were commemorated by a U.S. postage stamp issued in 1983. The last mule tram service in Mexico City ended in 1932, and a mule tram in Celaya, Mexico, survived until 1954. The last horse-drawn tram to be withdrawn from public service in the UK took passengers from Fintona railway station to Fintona Junction one mile away on the main Omagh to Enniskillen railway in Northern Ireland. The tram made its last journey on 30 September 1957 when the Omagh to Enniskillen line closed. The "van" now lies at the Ulster Transport Museum. 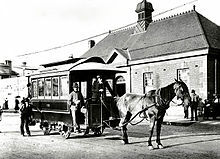 Horse-drawn trams still operate on the 1876-built Douglas Bay Horse Tramway in the Isle of Man, and at the 1894-built horse tram at Victor Harbor in South Australia. New horse-drawn systems have been established at the Hokkaidō Museum in Japan and also in Disneyland. A horse tram route in Polish gmina Mrozy, first built in 1902, was reopened in 2012. The first mechanical trams were powered by steam. Generally, there were two types of steam tram. The first and most common had a small steam locomotive (called a tram engine in the UK) at the head of a line of one or more carriages, similar to a small train. Systems with such steam trams included Christchurch, New Zealand; Sydney, Australia; other city systems in New South Wales; Munich, Germany (from August 1883 on), British India (Pakistan) (from 1885) and the Dublin & Blessington Steam Tramway (from 1888) in Ireland. Steam tramways also were used on the suburban tramway lines around Milan and Padua; the last Gamba de Legn ("Peg-Leg") tramway ran on the Milan-Magenta-Castano Primo route in late 1957. Winding drums of the London and Blackwall cable-operated railway, c. 1840. Another motive system for trams was the cable car, which was pulled along a fixed track by a moving steel cable. The power to move the cable was normally provided at a "powerhouse" site a distance away from the actual vehicle. The London and Blackwall Railway, which opened for passengers in east London, England, in 1840 used such a system. The most extensive cable system in the US was built in Chicago, having been built in stages between 1859 and 1892. New York City developed at least seven cable car lines.[when?] Los Angeles also had several cable car lines, including the Second Street Cable Railroad, which operated from 1885 to 1889, and the Temple Street Cable Railway, which operated from 1886 to 1898. The first cable car service in Melbourne, 1885. From its founding to 1940, Melbourne operated one of the largest cable car networks in the world. A San Francisco cable car in 2008. 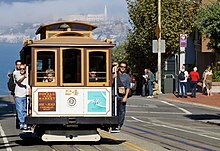 The cable car's effectiveness in hilly enviroments partially explains its continued use in San Francisco. In the late 19th and early 20th centuries a number of systems in various parts of the world employed trams powered by gas, naphtha gas or coal gas in particular. Gas trams are known to have operated between Alphington and Clifton Hill in the northern suburbs of Melbourne, Australia (1886–1888); in Berlin and Dresden, Germany; in Estonia (1921–1951); between Jelenia Góra, Cieplice, and Sobieszów in Poland (from 1897); and in the UK at Lytham St Annes, Neath (1896–1920), and Trafford Park, Manchester (1897–1908). Gross-Lichterfelde Tram in 1882. Early electric trams operated by the company lacked overhead wires, drawing current from the rails. The world's first electric tram line operated in Sestroretsk near Saint Petersburg, Russia, invented and tested by Fyodor Pirotsky in 1880. The second line was the Gross-Lichterfelde tramway in Lichterfelde near Berlin in Germany, which opened in 1881. It was built by Werner von Siemens who contacted Pirotsky. This was world's first commercially successful electric tram. It initially drew current from the rails, with overhead wire being installed in 1883. In Britain, Volk's electric railway was opened in 1883 in Brighton (see Volk's Electric Railway). This two kilometer line, re-gauged to 2 ft 9 in (838 mm) in 1884, remains in service to this day, and is the oldest operating electric tramway in the world. Also in 1883, Mödling and Hinterbrühl Tram was opened near Vienna in Austria. It was the first tram in the world in regular service that was run with electricity served by an overhead line with pantograph current collectors. The Blackpool Tramway, was opened in Blackpool, UK on 29 September 1885 using conduit collection along Blackpool Promenade. This system is still in operation in a modernised form. Volk's Electric Railway, c. 1890. Opened in 1883 and still in service today, it is the oldest operating electric tramway. 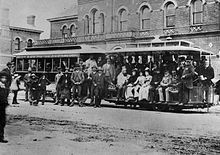 Earliest tram system in Canada was by John Joseph Wright, brother of the famous mining entrepreneur Whitaker Wright, in Toronto in 1883. In the US, multiple functioning experimental electric trams were exhibited at the 1884 World Cotton Centennial World's Fair in New Orleans, Louisiana, but they were not deemed good enough to replace the Lamm fireless engines then propelling the St. Charles Avenue Streetcar in that city. The first commercial installation of an electric streetcar in the United States was built in 1884 in Cleveland, Ohio and operated for a period of one year by the East Cleveland Street Railway Company. Trams were operated in Richmond, Virginia, in 1888, on the Richmond Union Passenger Railway built by Frank J. Sprague. Sprague later developed multiple unit control, first demonstrated in Chicago in 1897, allowing multiple cars to be coupled together and operated by a single motorman. This gave rise to the modern subway train. Following the improvement of an overhead "trolley" system on streetcars for collecting electricity from overhead wires by Sprague, electric tram systems were rapidly adopted across the world. Earlier installations proved difficult or unreliable. Siemens' line, for example, provided power through a live rail and a return rail, like a model train, limiting the voltage that could be used, and delivering electric shocks to people and animals crossing the tracks. Siemens later designed his own version of overhead current collection, called the bow collector, and Thorold, Ontario, opened in 1887, and was considered quite successful at the time. While this line proved quite versatile as one of the earliest fully functional electric streetcar installations, it required horse-drawn support while climbing the Niagara Escarpment and for two months of the winter when hydroelectricity was not available. It continued in service in its original form into the 1950s. Sidney Howe Short designed and produced the first electric motor that operated a streetcar without gears. The motor had its armature direct-connected to the streetcar's axle for the driving force. Short pioneered "use of a conduit system of concealed feed" thereby eliminating the necessity of overhead wire and a trolley pole for street cars and railways. While at the University of Denver he conducted important experiments which established that multiple unit powered cars were a better way to operate trains and trolleys. A tram in Budapest in 1908. The city established a network of electric trams in 1894. Sarajevo built a citywide system of electric trams in 1895. Budapest established its tramway system in 1887, and its ring line has grown to be the busiest tram line in Europe, with a tram running every 60 seconds at rush hour. Bucharest and Belgrade ran a regular service from 1894. Ljubljana introduced its tram system in 1901 – it closed in 1958. Oslo had the first tramway in Scandinavia, starting operation on 2 March 1894. The first electric tramway in Australia was a Sprague system demonstrated at the 1888 Melbourne Centennial Exhibition in Melbourne; afterwards, this was installed as a commercial venture operating between the outer Melbourne suburb of Box Hill and the then tourist-oriented country town Doncaster from 1889 to 1896. As well, electric systems were built in Adelaide, Ballarat, Bendigo, Brisbane, Fremantle, Geelong, Hobart, Kalgoorlie, Launceston, Leonora, Newcastle, Perth, and Sydney. Electric trams in Melbourne in 1979. Although trams saw extensive use in Australia in the early 20th century, by the 1970s, Melbourne was the only Australian city to operate a full tramway system. By the 1970s, the only full tramway system remaining in Australia was the Melbourne tram system. However, there were also a few single lines remaining elsewhere: the Glenelg Tram, connecting Adelaide to the beachside suburb of Glenelg, and tourist trams in the Victorian Goldfields cities of Bendigo and Ballarat. In recent years the Melbourne system, generally recognised as one of the largest in the world, has been considerably modernised and expanded. The Adelaide line has also been extended to the Entertainment Centre, and work is progressing on further extensions. Sydney re-introduced trams (or light rail) on 31 August 1997. A completely new system, known as G:link, was introduced on the Gold Coast, Queensland on 20 July 2014. The Newcastle Light Rail opened in February 2019, while the Canberra light rail is scheduled to open in April 2019. This will be the first time that there have been trams in Canberra, even though Walter Burley Griffin's 1914-1920 plans for the capital then in the planning stage did propose a Canberra tram system. An emergency earth connection (highlighted with arrows) is used to drop the current in the overhead lines to zero. Derailed electric trams are a hazard, as it requires contact with the rails for the current's return path. There is one particular hazard associated with trams powered from a trolley pole off an overhead line. 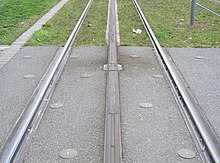 Since the tram relies on contact with the rails for the current return path, a problem arises if the tram is derailed or (more usually) if it halts on a section of track that has been particularly heavily sanded by a previous tram, and the tram loses electrical contact with the rails. In this event, the underframe of the tram, by virtue of a circuit path through ancillary loads (such as interior lighting), is live at the full supply voltage, typically 600 volts. In British terminology such a tram was said to be ‘grounded’—not to be confused with the US English use of the term, which means the exact opposite. Any person stepping off the tram completed the earth return circuit and could receive a nasty electric shock. In such an event the driver was required to jump off the tram (avoiding simultaneous contact with the tram and the ground) and pull down the trolley pole before allowing passengers off the tram. Unless derailed, the tram could usually be recovered by running water down the running rails from a point higher than the tram, the water providing a conducting bridge between the tram and the rails. Paris operated trams that were powered by compressed air using the Mekarski system. Convict tramways were human-powered tramways used in Port Arthur. The Convict Tramway  was hauled by human power in the form of convicts from the Port Arthur convict settlement. and was created to replace the hazardous sea voyage from Hobart to Port Arthur, Tasmania. Charles O'Hara Booth oversaw the construction of the tramway. It opened in 1836 and ran for 8 km (5 miles) from Oakwood to Taranna. By most definitions, the tramway was the first passenger-carrying railway/tramway in Australia. An unconfirmed report says that it continued to Eaglehawk Neck and, if this was so, the length of the tramway would have been more than doubled. The tramway carried passengers and freight, and ran on wooden rails. The gauge is unknown. The date of closure is unknown, but it was certainly prior to 1877. The only petrol-driven tram of Stockholms Spårvägar, on line 19, in the 1920s. Hastings and some other tramways, for example Stockholms Spårvägar in Sweden and some lines in Karachi, used petrol trams. Galveston Island Trolley in Texas operated diesel trams due to the city's hurricane-prone location, which would result in frequent damage to an electrical supply system. Although Portland, Victoria promotes its tourist tram as being a cable car it actually operates using a hidden diesel motor. The tram, which runs on a circular route around the town of Portland, uses dummies and salons formerly used on the extensive Melbourne cable tramway system and now beautifully restored. In the mid-20th century many tram systems were disbanded, replaced by buses, automobiles or rapid transit. The General Motors streetcar conspiracy was a case study of the decline of trams in the United States. In the 21st century, trams have been re-introduced in cities where they were had been closed down for decades (such as Tramlink in London), or kept in heritage use (such as Spårväg City in Stockholm). Vehicle fabricates from the 1990s and onwards (such as Bombardier's Flexity series and Alstom Citadis) are usually low-floor trams with features such as articulation and regenerative braking. Articulated trams are made up of multiple body sections, connected by flexible joints. Articulated trams, invented and first used by the Boston Elevated Railway in 1912–13 at a total length of about twelve meters long (40 ft) for each pioneering example of twin-section articulated tram car, have two or more body sections, connected by flexible joints and a round platform at their pivoting midsection(s). Like articulated buses, they have increased passenger capacity. In practice, these trams can be up to 56 metres (184 ft) long (such as CAF Urbos 3 in Budapest, Hungary), while a regular tram has to be much shorter. With this type, the articulation is normally suspended between carbody sections. In the Škoda ForCity, which is the world's first 100% low floor tram with pivoting bogies, a Jacobs bogie supports the articulation between the two or more carbody sections. An articulated tram may be low-floor variety or high (regular) floor variety. Newer model trams may be up to 72 metres (236 ft) long and carry 510 passengers at a comfortable 4 passengers/m2. At crush loadings this would be even higher. Since the 19th century goods have been carried on rail vehicles through the streets, often near docks and steelworks, for example the Weymouth Harbour Tramway in Weymouth, Dorset. Belgian vicinal tramway routes were used to haul agricultural produce, timber and coal from Blégny colliery while several of the US interurbans carried freight. In Australia, three different "Freight Cars" operated in Melbourne between 1927 and 1977 and the city of Kislovodsk in Russia had a freight-only tram system consisting of one line which was used exclusively to deliver bottled Narzan mineral water to the railway station. CarGoTram run by Volkswagen in Dresden. Trams operated by the service are used to carry freight, as opposed to passengers. Today, the German city of Dresden has a regular CarGoTram service, run by the world's longest tram trainsets (59.4 metres (195 ft)), carrying car parts across the city centre to its Volkswagen factory. In addition to Dresden, the cities of Vienna and Zürich currently use trams as mobile recycling depots. At the turn of the 21st century, a new interest has arisen in using urban tramway systems to transport goods. The motivation now is to reduce air pollution, traffic congestion and damage to road surfaces in city centres. One recent proposal to bring cargo tramways back into wider use was the plan by City Cargo Amsterdam to reintroduce them into the city of Amsterdam. In the spring of 2007 the city piloted this cargo tram operation, which among its aims aimed to reduce particulate pollution in the city by 20% by halving the number of lorries (5,000) unloading in the inner city during the permitted timeframe from 07:00 till 10:30. The pilot involved two cargo trams, operating from a distribution centre and delivering to a "hub" where special electric trucks delivered the trams' small containers to their final destination. The trial was successful, releasing an intended investment of €100 million in a fleet of 52 cargo trams distributing from four peripheral "cross docks" to 15 inner-city hubs by 2012. These specially built vehicles would be 30 feet (9.14 m) long with 12 axles and a payload of 30 tonnes (33.1 short tons; 29.5 long tons). On weekdays, trams are planned to make 4 deliveries per hour between 7 a.m. and 11 a.m. and two per hour between 11 a.m. and 11 p.m. With each unloading operation taking on average 10 minutes, this means that each site would be active for 40 minutes out of each hour during the morning rush hour. In early 2009 the scheme was suspended owing to the financial crisis impeding fund-raising. In 1937, Melbourne passenger tramcar C class number 30 was converted for transporting dogs and their owners to the Royal Melbourne Showgrounds. It was known as the "dog car", and was scrapped in 1955 . Hong Kong Tramways fleet is entirely made up of double-decker trams. A double-decker tram is a tram that has two levels. Some double-decker trams have open tops. The earliest double-deck trams were horse drawn. The first electric double-deck trams were those built for the Blackpool Tramway in 1898, one of which survives at the National Tramway Museum. Double decker trams were commonplace in Great Britain and Dublin Ireland before most tramways were torn up in the 1950s and 1960s. New York City's New York Railways experimented in 1912 with a Brill double deck Hedley-Doyle stepless centre entrance car, nicknamed the "Broadway Battleship", a term that spread to other large streetcars. Hobart, Tasmania, Australia made extensive use of double decker trams. Arguably the most unusual double-decker tram used to run between the isolated Western Australian outback town of Leonora and the nearby settlement of Gwalia. Double decker trams still operate in Alexandria, Blackpool, Hong Kong, Dubai and Oranjestad. Many early 20th century trams used a lowered central section between the bogies (trucks). This made passenger access easier, reducing the number of steps required to reach the inside of the vehicle. These cars were frequently referred to as "drop-centres". It is believed that the design first originated in Christchurch, New Zealand, in 1906 when Boon & Co Ltd. built 26 such trams in three series. A number of these trams have been preserved. They were a popular design in Australia and New Zealand, with at least 780 such tramcars being built for use in Melbourne alone. Trams built since the 1970s have had conventional high or low floors. Hearse trams in Paris. Trams were used as hearses in the late 19th and early 20th century. Specially appointed hearse trams, or funeral trolley cars, were used for funeral processions in many cities in the late 19th and early 20th century, particularly cities with large tram systems. The earliest known example in North America was Mexico City, which was already operating 26 funeral cars in 1886. In the United States, funeral cars were often given names. At the turn of the century, "almost every major city [in the US] had one or more":93 such cars in operation. In Milan, Italy, hearse trams were used from the 1880s (initially horse-drawn) to the 1920s. The main cemeteries, Cimitero Monumentale and Cimitero Maggiore, included funeral tram stations. Additional funeral stations were located at Piazza Firenze and at Porta Romana. In the mid-1940s at least one special hearse tram was used in Turin, Italy. It was introduced due to the wartime shortage of automotive fuel. Newcastle, Australia also operated two hearse trams between 1896 and 1948. A low-floor tram (left) compared to a "high-floor" tram (right). Since the 1990s manufacturers have atttempted to reduce the floor level of trams to street level. From around the 1990s, light rail vehicles not made for the occasional high platform light rail system have usually been of partial or fully low-floor design, with the floor 300 to 360 mm (11.8 to 14.2 in) above top of rail, a capability not found in older vehicles. This allows them to load passengers, including those in wheelchairs or with perambulators directly from low-rise platforms that are not much more than raised footpaths/sidewalks. This satisfies requirements to provide access to disabled passengers without using expensive wheelchair lifts, while at the same time making boarding faster and easier for other passengers. Passengers appreciate the ease of boarding and alighting from low-floor trams and moving about inside 100 per cent low-floor trams. Passenger satisfaction with low-floor trams is high. In some jurisdictions this has even been made mandatory since the 1990s, for example by the HMRI in Britain and the Disability discrimination act in the United Kingdom and other Commonwealth countries. Various companies have developed particular low-floor designs, varying from part-low-floor (with internal steps between the low-floor section and the high-floor sections over the bogies), e.g. Citytram and Siemens S70, to 100 per cent low-floor, where the floor passes through a corridor between the drive wheels, thus maintaining a relatively constant (stepless) level from end to end of the tram. Prior to the introduction of the Škoda ForCity, this carried the mechanical penalty of requiring bogies to be fixed and unable to pivot (except for less than 5 degrees in some trams) and thus reducing curve negotiation. This creates undue wear on the tracks and wheels. Low-floor trams are now running in many cities around the world, including Adelaide, Amsterdam, Bratislava, Dublin, Gold Coast, Helsinki, Hiroshima, Houston, Istanbul, Melbourne, Milan, Prague, Sydney, Lviv and many others. 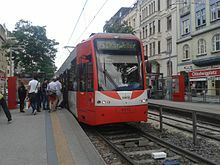 The Ultra Low Floor or (ULF) tram is a type of low-floor tram operating in Vienna, Austria as of 1997 and in Oradea, Romania, with the lowest floor-height of any such vehicle. In contrast to other low-floor trams, the floor in the interior of ULF is at sidewalk height (about 18 cm or 7 inches above the road surface), which makes access to trams easy for passengers in wheelchairs or with baby carriages. This configuration required a new undercarriage. The axles had to be replaced by a complicated electronic steering of the traction motors. Auxiliary devices are installed largely under the car's roof. The low-floor Škoda 15 T use a pivoting bogie in order to help the tram pivot on curved tracks. Most low-floor trams carry the mechanical penalty of requiring bogies to be fixed and unable to pivot. This creates undue wear on the tracks and wheels and reduces the speed at which a tram can drive through a curve. Some manufacturers such as Citadis deal with the issue by introducing partially high floor trams. Others, such as Škoda, developed pivoting bogies at the ends and with jacobs bogies between the articulations for the Škoda 15 T, but this solution proved expensive. A custom-built snow removal tram in Bucharest. It uses a rotating brush to push the snow aside from the tracks. Most systems had cars that were converted to specific uses on the system, other than simply the carriage of passengers. As just one example of a system, Melbourne used or uses the following "technical" cars: a ballast motor, ballast trailers, blow-down cars, breakdown cars, conductors' or drivers' instruction cars, a laboratory testing car, a line marking car, a pantograph testing car, per way locomotives, a rail hardener locomotive, a scrapper car, scrubbers, sleeper carriers, track cleaners, a welding car, and a wheel transport car. Some were built new for specific purposes, including: rail grinders, scrubbers/track cleaners, and a workshops locomotive. Munich tram No.24, delivered in 1912, was refurbished as a mobile library in 1928. Known as "Städtische Wanderbücherei München", it was in public service until 1970. It was preserved and is now on public display in a railway museum in Hanover. Edmonton, Alberta, used a streetcar bookmobile from 1941 to 1956. After World War II, in both Warsaw and Wrocław, Poland, so-called trams-nurseries were in operation, collecting children from the workplaces of their parents (often tram employees). These mobile nurseries either carried the children around the system or delivered them to the nursery school run by transport company. Interior of the Colonial Tramcar Restaurant. The company uses three converted trams as restaurant trams. A number of systems have introduced restaurant trams, particularly as a tourist attraction. This is specifically a modern trend. Systems which have or have had restaurant trams include Adelaide, Bendigo and Melbourne, in Australia; Brussels in Belgium; The Hague in the Netherlands; Christchurch in New Zealand; Milan, Rome and Turin in Italy; Moscow, Russia; Almaty, Kazakhstan  and Zürich, Switzerland. Restaurant trams are particularly popular in Melbourne where three of the iconic W class trams have been converted. All three often run in tandem and there are usually multiple meal sittings. Bookings often close months in advance. As from mid-October 2018, Melbourne's restaurant trams were temporarily taken off the road after failing a Yarra Trams' safety assessment due to badly weathered underlying structures. Until the trams again meet safety standards, the trams are offering stationery dining. Bistro trams with buffets operated on ordinary services between 1924 and 2014 on the U76 Rheinbahn route between Krefeld and Düsseldorf in Germany, and for a short period in 1911 on the Amsterdam-Zandvoort line. Helsinki in Finland has a pub tram. Frankfurt, Germany, has a tourist circle line called "Ebbelwei-Express", in which the traditional local drink "Apfelwein" (locally called "Ebbelwei", a type of hard cider) is served. Trams are typically designed as uni-directional single-ended vehicles, or double-ended vehicles capable of being driven in both directions. A double-ended tram has an operator's cab and controls at each end of the vehicle, which allows it to easily be driven at full speed in either direction on a continuous segment of track. Typically at the end of a run, the tram's operator will walk from one end of the tram to the other, and then commence the tram route in the other direction. The tram is usually switched to another track by use of crossover points or Y-points. Conversely, a single-ended vehicle needs a method of turning at termini so that the operator's cab is in the front of the tram for the reverse journey. This usually necessitates a turning loop or triangle. On the other hand, the single cab and controls and fewer door spaces make the tram lighter, increases passenger accommodation (including many more seats) and effects reductions in equipment, weight, first-cost, maintenance cost, and operating expense. A single-ended tram has operator's controls at only one end, and can safely be driven at speed in the forward direction but is also capable of reverse movement, typically at slower speed, using a small set of controls at the rear. The configuration of the doors is usually asymmetrical, favouring the side expected to be closest to the street kerb and footpath. At the end of a run, the tram must be turned around via a balloon loop or some other method, to face in the opposite direction for a return trip. In addition, if overhead electrical power is fed from a trolley pole, the direction of the trolley pole must be reversed at the end of the run, to ensure that the pole is "pulled" behind or "trailing" the vehicle, to avoid 'dewiring'. This was achieved by a member of the crew swinging the pole through 180 degrees (if there was only one pole) or lowering one pole and raising the other if there were two. More commonly nowadays, a bidirectional pantograph may be used to feed power, eliminating the need for an extra procedure when reversing direction. Two single-ended trams with doors on both sides may be coupled into a (semi-)permanently coupled married pair or twinset, with operator's controls at each end of the combination. Such a setup is operated as if it were a double-ended tram, except that the operator must exit one vehicle and enter the other, when reversing at the end of the run. A heritage tram operated by Tranvía de Sóller. Heritage trams are operated in an effort to draw tourists and tram enthusiasts. Many systems have retained historical trams which will often run over parts of the system for tourists and tram enthusiasts. In Melbourne, Australia, a number of the iconic W class run throughout each day in a set route which circles the Central Business District. They are primarily for the use of tourists, although often also used by regular commuters. A tram-train is a light-rail public transport system where trams run through from an urban tramway network to main-line railway lines which are shared with conventional trains. This allows passengers to travel from suburban areas into city-centre destinations without having to change from a train to a tram. Tram-train operation uses vehicles such as the Flexity Link and Regio-Alstom Citadis, which are suited for use on urban tram lines and also meet the necessary indication, power, and strength requirements for operation on main-line railways. It has been primarily developed in Germanic countries, in particular Germany and Switzerland. Karlsruhe is a notable pioneer of the tram-train. Two former passenger cars from the Melbourne system were converted and used as mobile offices within the Preston Workshops between 1969 and 1974, by personnel from Commonwealth Engineering and ASEA who were connected with the construction of Melbourne's Z Class cars. Rubber tyres used for the Translohr rubber-tyred trams. Rubber-tyred trams are trams that are guided by fixed rail, but also make use of rubber tyres. A rubber-tyred tram is a guided bus which is guided by a fixed rail on the ground and uses overhead cables like a conventional tram. This can allow the vehicles to match the capacity of conventional trams and cope with gradients up to 13% due to the rubber tyres. There are two systems which use this technology: the Guided Light Transit (GLT) and Translohr. The GLT "trams" are legally considered buses as they have steering wheels and can leave the fixed rail when requirements dictate e.g. when journeying to a depot while a Translohr "tram" cannot operate without a guidance rail and are generally not considered buses. With the development of technologies for self-guided vehicles, it is now possible to dispense with the guide rail. The Autonomous Rail Rapid Transit system planned for Zouzhou in China follows a virtual track. The Eurotram series was developed by Socimi of Italy. It is used by Strasbourg, Milan, and Porto. The Eurotram has a modern design that makes it look almost as much like a train as a tram, and has large windows along its entire length. The Citadis tram, flagship of the French manufacturer Alstom, enjoys an innovative design combining lighter bogies with a modular concept for carriages providing more choices in the types of windows and the number of cars and doors. The recent Citadis-Dualis, intended to run at up to 100 km/h (62 mph), is suitable for stop spacings ranging from 500 m (1,600 ft) to 5 km (3.1 mi). Dualis is a strictly modular partial low-floor car, with all doors in the low-floor sections. There are two main types of tramways, the classic tramway built in the early 20th century with the tram system operating in mixed traffic, and the later type which is most often associated with the tram system having its own right of way. Tram systems that have their own right of way are often called light rail but this does not always hold true. Though these two systems differ in their operation, their equipment is much the same. Trams were traditionally operated with separate levers for applying power and brakes. More modern vehicles use a locomotive-style controller which incorporate a dead man's switch. The success of the PCC streetcar had also seen trams use automobile-style foot controls allowing hands-free operation, particularly when the driver was responsible for fare collection. Overhead lines are used to provide power for most electric trams. Electric trams use various devices to collect power from overhead lines. The most common device found today is the pantograph, while some older systems use trolley poles or bow collectors. Ground-level power supply has become a recent innovation. Another new technology uses supercapacitors; when an insulator at a track switch cuts off power from the tram for a short distance along the line, the tram can use energy stored in a large capacitor to drive the tram past the gap in the power feed. A rather obsolete system for power supply is conduit current collection. The old tram systems in London, Manhattan (New York City), and Washington, D.C., used live rails, like those on third-rail electrified railways, but in a conduit underneath the road, from which they drew power through a plough. It was called Conduit current collection. Washington's was the last of these to close, in 1962. Today, no commercial tramway uses this system. More recently, a modern equivalent to these systems has been developed which allows for the safe installation of a third rail on city streets, which is known as surface current collection or ground-level power supply; the main example of this is the new tramway in Bordeaux. A section of APS track in Bordeaux with powered and neutral sections. A ground-level power supply system also known as Surface current collection or Alimentation par le sol (APS) is an updated version of the original stud type system. APS uses a third rail placed between the running rails, divided electrically into eight-metre powered segments with three metre neutral sections between. Each tram has two power collection skates, next to which are antennas that send radio signals to energize the power rail segments as the tram passes over them. Older systems required mechanical switching systems which were susceptible to environmental problems. At any one time no more than two consecutive segments under the tram should actually be live. Wireless and solid state switching remove the mechanical problem. Alstom developed the system primarily to avoid intrusive power supply cables in the sensitive area of the old city of old Bordeaux. Route patterns vary greatly among the world's tram systems, leading to different network topologies. Most systems start by building up a strongly nucleated radial pattern of routes linking the city centre with residential suburbs and traffic hubs such as railway stations and hospitals, usually following main roads. Some of these, such as those in Hong Kong, Blackpool, Ulm and Bergen, still essentially comprise a single route. Some suburbs may be served by loop lines connecting two adjacent radial roads. Some modern systems have started by reusing existing radial railway tracks, as in Nottingham and Birmingham, sometimes joining them together by a section of street track through the city centre, as in Manchester. Later developments often include tangential routes linking adjacent suburbs directly, or multiple routes through the town centre to avoid congestion (as in Manchester's Second City Crossing. Other new systems, particularly those in large cities which already have well-developed metro and suburban railway systems, such as London and Paris, have started by building isolated suburban lines feeding into railway or metro stations. In Paris these have then been linked by ring lines. A third, weakly nucleated, route pattern may grow up where a number of nearby small settlements are linked, such as in the coal-mining areas served by BOGESTRA or the Silesian Interurbans. A fourth starting point may be a loop in the city centre, sometimes called a downtown circulator, as in Portland or El Paso. Occasionally a modern tramway system may grow from a preserved heritage line, as in Stockholm. The resulting route patterns are very different. Some have a rational structure, covering their catchment area as efficiently as possible, with new suburbs being planned with tramlines integral to their layout – such is the case in Amsterdam. Bordeaux and Montpellier have built comprehensive networks, based on radial routes with numerous interconnections, within the last two decades. Some systems serve only parts of their cities, with Berlin being the prime example, owing to the fact that trams survived the city's political division only in the Eastern part. Other systems have ended up with a rather random route map, for instance when some previous operating companies have ceased operation (as with the tramways vicinaux/buurtspoorwegen in Brussels) or where isolated outlying lines have been preserved (as on the eastern fringe of Berlin). In Rome, the remnant of the system comprises 3 isolated radial routes, not connecting in the ancient city centre, but linked by a ring route. Some apparently anomalous lines continue in operation where a new line would not on rational grounds be built, because it is much more costly to build a new line than continue operating an existing one. In some places, the opportunity is taken when roads are being repaved to lay tramlines (though without erecting overhead cables) even though no service is immediately planned: such is the case in Lepizigerstraße in Berlin, the Haarlemmer Houttuinen in Amsterdam, and Botermarkt in Ghent. Tram systems operate across national borders in Basel (from Switzerland into France and Germany) and Strasbourg (From France into Germany). It is planned to open a line linking Hasselt (Belgium) with Maastricht (Netherlands) in 2021. Cross section of a grooved tram rail. Tramway track can have different rail profiles to accommodate the various operating environments of the vehicle. They may be embedded into concrete for street-running operation, or use standard ballasted track with railroad ties on high-speed sections. A more ecological solution is to embed tracks into grass turf. Tramway tracks use a grooved rail with a groove designed for tramway or railway track in pavement or grassed surfaces (grassed track or track in a lawn). The rail has the railhead on one side and the guard on the other. The guard provides accommodation for the flange. The guard carries no weight, but may act as a checkrail. Grooved rail was invented in 1852 by Alphonse Loubat, a French inventor who developed improvements in tram and rail equipment, and helped develop tram lines in New York City and Paris. The invention of grooved rail enabled tramways to be laid without causing a nuisance to other road users, except unsuspecting cyclists, who could get their wheels caught in the groove. The grooves may become filled with gravel and dirt (particularly if infrequently used or after a period of idleness) and need clearing from time to time, this being done by a "scrubber" tram. Failure to clear the grooves can lead to a bumpy ride for the passengers, damage to either wheel or rail and possibly derailing. In narrow situations double-track tram lines sometimes reduce to single track, or, to avoid switches, have the tracks interlaced, e.g. in the Leidsestraat in Amsterdam on three short stretches (see map detail); this is known as interlaced or gauntlet track. There is a UK example of interlaced track on the Tramlink, just west of Mitcham Station, where the formation is narrowed by an old landslip causing an obstruction. (See photo in Tramlink entry). Historically, the track gauge has had considerable variations, with narrow gauge common in many early systems. However, most light rail systems are now standard gauge. An important advantage of standard gauge is that standard railway maintenance equipment can be used on it, rather than custom-built machinery. Using standard gauge also allows light rail vehicles to be delivered and relocated conveniently using freight railways and locomotives. Another factor favoring standard gauge is that low-floor vehicles are becoming popular, and there is generally insufficient space for wheelchairs to move between the wheels in a narrow gauge layout. Standard gauge also enables – at least in theory – a larger choice of manufacturers and thus lower procurement costs for new vehicles. However, other factors such as electrification or loading gauge for which there is more variation may require costly custom built units regardless. Tram stops can range from purpose-built, tram-exclusive facilties (left), to simple stops within a public road (right). Tram stops may be similar to bus stops in design and use, particularly in street-running sections, where in some cases other vehicles are legally required to stop clear of the tram doors. Some stops may resemble to railway platforms, particularly in private right-of-way sections and where trams are boarded at standard railway platform height, as opposed to using steps at the doorway or low-floor trams. Approximately 5,000 new trams are manufactured each year. As of February 2017, 4,478 new trams were on order from their makers, with options being open for a further 1,092. Produced from 1923 to 1924, the 900 Series tram is still used by the New Orleans tram system. Trams typically have longer service life than internal combustion buses. Trams (and road public transport in general) can be much more efficient in terms of road usage than cars – one vehicle replaces about 40 cars (which take up a far larger area of road space). Vehicles run more efficiently compared to similar vehicles that use rubber tyres, since the rolling resistance of steel is lower[dubious – discuss]. Overall operating costs are lower. Tram vehicles are very durable, with some being in continuous revenue service for more than fifty years. This is especially compared to internal combustion buses, which tend to require high amounts of maintenance and break down after less than 20 years, mostly due to the vibrations of the engine. In many cases tram networks have a higher capacity than similar buses. This has been cited as a reason for the replacement of one of Europe's busiest bus lines (with three-minute headways in peak times) with a tram by Dresdner Verkehrsbetriebe. A sign advising cyclists to dismount due to tram tracks. Tram tracks pose a hazard for cyclists, as their wheels may get caught in the track. Tram tracks can be hazardous for cyclists, as bikes, particularly those with narrow tyres, may get their wheels caught in the track grooves. It is possible to close the grooves of the tracks on critical sections by rubber profiles that are pressed down by the wheelflanges of the passing tram but that cannot be lowered by the weight of a cyclist. If not well-maintained, however, these lose their effectiveness over time. When wet, tram tracks tend to become slippery and thus dangerous for bicycles and motorcycles, especially in traffic. In some cases, even cars can be affected. The opening of new tram and light rail systems has sometimes been accompanied by a marked increase in car accidents, as a result of drivers' unfamiliarity with the physics and geometry of trams. Though such increases may be temporary, long-term conflicts between motorists and light rail operations can be alleviated by segregating their respective rights-of-way and installing appropriate signage and warning systems. Rail transport can expose neighbouring populations to moderate levels of low-frequency noise. However, transportation planners use noise mitigation strategies to minimise these effects. Most of all, the potential for decreased private motor vehicle operations along the tram's service line because of the service provision could result in lower ambient noise levels than without. Trams are in a period of growth, with about 800 tram systems operating around the world, 10 or so new systems being opened each year, and many being gradually extended. Some of these systems date from the late 19th or early 20th centuries. In the past 20 years their numbers have been augmented by modern tramway or light rail systems in cities that had discarded this form of transport. There have also been some new tram systems in cities that never previously had them. 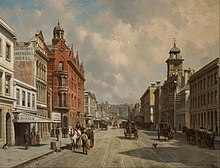 Tramways with tramcars (British English) or street railways with streetcars (North American English) were common throughout the industrialised world in the late 19th and early 20th centuries but they had disappeared from most British, Canadian, French and US cities by the mid-20th century. By contrast, trams in parts of continental Europe continued to be used by many cities, although there were contractions in some countries, including the Netherlands. Since 1980 trams have returned to favour in many places, partly because their tendency to dominate the roadway, formerly seen as a disadvantage, is now considered to be a merit since it raises the visibility of public transport (encouraging car users to change their mode of travel), and enables streets to be reconfigured to give more space to pedestrians, making cites more pleasant places to live. New systems have been built in the United States, Great Britain, Ireland, Italy, France, Australia and many other countries. In Milan, Italy, the old "Ventotto" trams are considered by its inhabitants a "symbol" of the city. The same can be said of trams in Melbourne in general, but particularly the iconic W class. 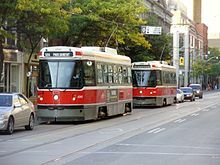 The Toronto streetcar system had similarly become an iconic symbol of the city, operating the largest network in the Americas as well as the only large-scale tram system in Canada (not including light rail systems, or heritage lines). Map of Melbourne's tram system in 2009 (with proposed extension). The tram system is the largest the world. The largest tram ((classic tram, streetcar, straßenbahn) and fast tram (light rail, stadtbahn)) networks in the world by route length (as of 2016) are Melbourne (256 km; 159 mi), Saint Petersburg (205.5 km; 127.7 mi), Cologne (194.8 km; 121.0 mi), Berlin (191.6 km; 119.1 mi), Moscow (183 km; 114 mi), Budapest (172 km; 107 mi), Katowice agglomeration (171 km; 106 mi) and Vienna (170 km; 110 mi). Other large systems include (but are not limited to): Dallas Light Rail, modern streetcar and heritage streetcar (155 km; 96 mi), Sofia (153.6 km; 95.4 mi), Leipzig (148.3 km; 92.1 mi), Łódź (145 km; 90 mi), Bucharest (143 km; 89 mi), Prague (142.4 km; 88.5 mi), Kiev (139.9 km; 86.9 mi), Brussels (138.9 km; 86.3 mi), Warsaw (138 km; 86 mi), Dresden (134 km; 83 mi), Los Angeles (133.1 km; 82.7 mi), Bonn Stadtbahn and streetcars (125.32 km; 77.87 mi), Stuttgart (124.5 km; 77.4 mi), Hanover (121 km; 75 mi), Zagreb (116.3 km; 72.3 mi), Bremen (114.6 km; 71.2 mi), Portland metropolitan area light rail and streetcars (108.2 km; 67.2 mi), Paris (104.9 km; 65.2 mi), Mannheim/Ludwigshafen (103.4 km; 64.2 mi), Riga (99.52 km; 61.84 mi), Gothenburg (95 km; 59 mi), Kassel (93.3 km; 58.0 mi), Manchester (92.5 km; 57.5 mi), Kraków (90 km; 56 mi), Dnipro (87.8 km; 54.6 mi), Halle (Saale) (87.6 km; 54.4 mi), San Diego (86.1 km; 53.5 mi), Pavlodar (86 km; 53 mi), Turin (84 km; 52 mi), Bochum/Gelsenkirchen (84 km; 52 mi), Zurich (84 km; 52 mi), Toronto (83 km; 52 mi), Amsterdam (80.5 km; 50.0 mi), Munich (79 km; 49 mi), Antwerp (79 km; n49 mi), Denver (76 km; 47 mi), Iași (76 km; 47 mi), Salt Lake Valley light rail and streetcar (75.42 km (46.86 mi)), Dortmund (75 km; 47 mi), Rotterdam (75 km; 47 mi),St. Louis Metropolitan Area (74 km; 46 mi), Lviv (73.5 km; 45.7 mi), Mykolaiv (72.83 km; 45.25 mi), Karlsruhe (71.5 km; 44.4 mi), Brno (70.4 km; 43.7 mi), Porto (70 km; 43 mi), Sacramento (69 km; 43 mi), Frankfurt am Main (68 km; 42 mi), San Jose and its suburbs (67.9 km; 42.2 mi), Lyon (66.3 km; 41.2 mi), Ostrava (65.7 km; 40.8 mi), Basel (65.7 km; 40.8 mi, Donetsk (65.7 km; 40.8 mi), Poznań (65.6 km; 40.8 mi), Minsk (62.8 km; 39.0 mi), Szczecin (60 km; 37 mi), Graz (59.8 km; 37.2 mi), Montpellier (55.6 km; 34.5 mi), Pyongyang (53.5 km; 33.2 mi), Essen (52.4 km; 32.6 mi) and Gdańsk (52.2 km; 32.4 mi). This list is not exhaustive. 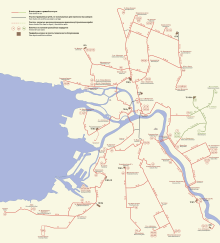 Map of Saint Petersburg's tram system in 2013. The system was once the world's largest, before its was surpased by Melbourne's system. The length of the following networks is disputed: Philadelphia trolleycar network comprise from Subway–Surface Trolley Lines with line length 31.9 km; 19.8 mi or by another source 100.8 km; 62.6 mi (the sum of all lines (lines 10 (18.7 km; 11.6 mi), 11 (21.4 km; 13.3 mi), 13 (18.3 km; 11.4 mi), 34 (16.3 km; 10.1 mi) and 36 (26.1 km; 16.2 mi)), light rail routes 101 and 102 with length 19.2 km (11.9 mi) and heritage route 15 (line length 13.7 km (8.5 mi)). Put together, it measures 64.6 or 133.5 km (40.1 or 83.0 mi) of line length. The route length is 86.6 km (53.8 mi). Next, San Francisco light rail and streetcars have route length 50 km (31 mi) or 59.4 km (36.9 mi). Except it, in city is 8.3 km (5.2 mi) of cable car. Next networks with disputed route length are Milan (126.5 km; 78.6 mi) or 181 km (112 mi), Düsseldorf Stadtbahn (76 km; 47 mi) or 78 km (48 mi)/streetcars 72 km (45 mi) or 68.5 km (42.6 mi), The Hague (105 km; 65 mi) or by other sources 142 km (88 mi), Strasbourg (40.4 km; 25.1 mi) or 57.5 km (35.7 mi), Kolkata (57 km; 35 mi) or 68 km (42 mi), Nizhny Novgorod (formerly Gorky) (98 km; 61 mi) or 76.5 km (47.5 mi). This list is not exhaustive. The longest single tram line in the world is the 68 km (42 mi) Belgian Coast Tram, which runs almost the entire length of the Belgian coast. Another fairly long line is the Valley Metro Rail in Phoenix, Arizona, with its 42 km (26 mi). At its peak, the Paris tram system was the world's largest, with over 1,111 kilometres (690 mi) of track in 1925. Historically, the Paris Tram System was, at its peak, the world's largest system, with 1,111 km (690 mi) of track in 1925 (according to other sources, ca. 640 km (400 mi) of route length in 1930). However it was completely closed in 1938. The next largest system appears to have been 857 km (533 mi), in Buenos Aires before 19 February 1963. The third largest was Chicago, with over 850 km (530 mi) of track, but it was all converted to trolleybus and bus services by 21 June 1958. Before its decline, the BVG in Berlin operated a very large network with 634 km (394 mi) of route. Before its system started to be converted to trolleybus (and later bus) services in the 1930s (last tramway closed 6 July 1952), the first-generation London network had 555 km (345 mi) of route in 1931. In 1958 trams in Rio de Jainero were employed on (433 km; 269 mi) of track. The final line, the Santa teresa route was closed in 1968. During a period in the 1980s, the world's largest tram system was in Leningrad (now known as St. Petersburg) with 350 km (220 mi), USSR, and was included as such in the Guinness World Records; however Saint Petersburg's tram system has declined in size since the fall of the Soviet Union. Wiena (Vienna) in 1960 had 340 km (211 mi), before the expansion of bus services and the opening of a subway (1976). Substituting subway services for tram routes continues. 320 km (199 mi) was in Minneapolis-Saint Paul in 1947: There streetcars ended 31 October 1953 in Minneapolis and 19 June 1954 in St. Paul. The Sydney tram network, before it was closed on 25 February 1961, had 291 km (181 mi) of route, and was thus the largest in Australia. As from 1961, the Melbourne system (currently recognised as the world's largest) took over Sydney's title as the largest network in Australia. The longest systems are in Moscow (417 km or 259 mi), Melbourne (254 km or 158 mi), Saint Petersburg (228 km or 142 mi), Katowice (Upper Silesian Industrial Region) (200 km or 120 mi), Cologne (193 km or 120 mi), Berlin (192 km or 119 mi), Budapest (172 km or 107 mi), and Vienna and Milan (170 km or 110 mi). The most intensely used networks (passengers per km of, per year) are: Istanbul, Hong Kong, Tokyo and Sarajevo. Between 1997 and 2014, 400–450 vehicles have been built per year. As of October 2015, Hong Kong has the world's only exclusively double-decker tramway system. A tram in Shanghai in 1908. Trams were well established in Asia at the start of the 20th century. Tramway systems were well established in the Asian region at the start of the 20th century, but started a steady decline during the mid to late 1930s. The 1960s marked the end of its dominance in public transportation with most major systems closed and the equipment and rails sold for scrap; however, some extensive original lines still remain in service in Hong Kong and Japan. In recent years there has been renewed interest in the tram with modern systems being built in Japan and China. Several cities in China had tram systems during the 20th century; however, by the end of the century, only Dalian, Hong Kong and Changchun remained extant. However the 21st century has seen a resurgence in development of tram transport as China struggles with urban traffic congestion and pollution with at least 15 systems operating. Hong Kong has an exclusive fleet of double-decker trams. As of 2017, Chengdu, Sanya, Wuyishan and Haikou have new tram systems under construction. Zhuhai tram line 1 opened in 2017. The first Japanese tram line was inaugurated in 1895 as the Kyoto Electric Railroad. The tram reached its zenith in 1932 when 82 rail companies operated 1,479 kilometers of track in 65 cities. The tram declined in popularity through the remaining years of the 1930s and during the 1960s many of the remaining operational tramways were shut down or converted into commuter railway lines. A tram in Kolkata, India. Trams were introduced in British India and still remain in popular use. In India, trams are in operation in Kolkata. Trams were discontinued in Chennai in 1954 and in Mumbai in 1960. The Northern and Central areas of the City of Colombo in Sri Lanka had an electric Tram Car system (3 ft 6 in or 1,067 mm gauge). This system commenced operations about 1900 and was discontinued by 1960. However, a new tram system is in the process of being brought to Colombo as part of the plan of Western Region Megapolis. Other countries with discontinued tram systems include Indonesia, Singapore, Malaysia, Thailand, Pakistan and Vietnam. However, a tram system is planned for construction in Gwadar, Pakistan where construction started in late 2011. Trams are also under construction in DHA City, Karachi. In China the cities of Beijing, Zhuhai, Nanjing and Shenzhen are planning tram networks for the future. Cologne Stadtbahn is the largest tram network in the European Union. In many European cities much tramway infrastructure was lost in the mid-20th century, though not always on the same scale as in other parts of the world such as North America. Most of Central and Eastern Europe retained the majority of its tramway systems and it is here that the largest and busiest tram systems in the world are found. Whereas most systems and vehicles in the tram sector are found in Central and Eastern Europe, in the 1960s and 1970s, tram systems were shut down in many places in Western Europe, however urban transportation has been experiencing a sustained long running revival since the 1990s. Many European cities are rehabilitating, upgrading, expanding and reconstructing their old tramway lines and building new tramway lines. Pacific Electric Railway streetcars awaiting destruction in 1956. Most North American streetcar systems were torn up in the mid-20th century. In North America, these vehicles are called "streetcars" (or "trolleys"); the term tram is more likely to be understood as an aerial tramway or a people-mover. Streetcar systems were developed in late 19th to early 20th centuries in a number of cities throughout North America. However, most North American cities saw its streetcar lines removed in the mid-20th century for a variety of financial, technological and social reasons. Exceptions included Boston, Cleveland, Mexico City, New Jersey, New Orleans, Newark, Philadelphia, Pittsburgh, San Francisco, and Toronto. Pittsburgh had kept most of its streetcar system serving the city and many suburbs until severe cutbacks on 27 January 1967, making it the longest-lasting large-network US streetcar system, though Pittsburgh's surviving streetcar lines were converted to light rail in the 1980s. San Francisco's Muni Metro system is the largest surviving streetcar system in the United States, and has even revived previously closed streetcar lines such as the F Market & Wharves heritage streetcar line. The Toronto streetcar system is the largest streetcar system in the Americas. Toronto currently has the largest streetcar system in the Americas in terms of track length and ridership, operated by the Toronto Transit Commission. This is the only large-scale streetcar system existing in Canada, not including the light rail systems that some Canadian cities currently operate, or heritage streetcar lines operating only seasonally. Toronto's system currently uses Canadian Light Rail Vehicles and Articulated Light Rail Vehicles, after a history of using PCCs, Peter Witt cars, and horse-drawn carriages. The TTC has begun accepting delivery of a fleet of 204 of a variant of Bombardier's Flexity Outlook (also used in some European tram systems) as a replacement. Newer light rail lines in Toronto and Kitchener-Waterloo will be using the Flexity Freedom. Streetcars once existed in Edmonton and Calgary, but both Canadian cities shut down their streetcar systems. In the late 1970s and early 1980s, both cities built and expanded new light rail systems. Streetcars also once operated in cities such as Ottawa, Montreal, Quebec City, Kitchener, Hamilton, Kingston, London, Windsor, Peterborough, Regina, and Saskatoon. Some of these cities have restored their old streetcars and now run them as a heritage feature for tourists, such as the Vancouver Downtown Historic Railway. Opened in 2001, the Portland Streetcar was the first (non-heritage) tram network established in North America in decades. In a trend started in the 1980s, some American cities have brought back streetcars, examples of these being Memphis, Portland, Tampa, Little Rock, Seattle and Dallas. Prior to 2000, most of these new-generation streetcar systems were heritage streetcar lines, using vintage or replica-vintage vehicles, but following the 2001 opening of the Portland Streetcar system – the first to use modern vehicles – most new US systems have been designed to use modern, low-floor cars. Several additional cities are planning or proposing new streetcar systems, and such systems are under construction in Atlanta, Charlotte, Cincinnati, Dallas (a second system), Detroit, Kansas City, Los Angeles, Milwaukee, Oklahoma City, Tucson, and Washington, D.C.. Alternatively, in the late 20th century, several cities installed modern light rail systems, in part along the same corridors as their old streetcars systems, the first of these being the San Diego Trolley in San Diego in 1981. A painting of Auckland in 1889 with horse-drawn trams on the roadway. Historically, there have been trams in the following Australian cities and towns: Adelaide, Ballarat, Bendigo, Brisbane, Broken Hill, Fremantle, Gawler, Geelong, Hobart, Kalgoorlie, Launceston, Leonora, Maitland, Melbourne, Moonta–Wallaroo, Newcastle, Perth, Rockhampton, Sorrento, Sydney, and Victor Harbor. These ranged from extensive systems to single lines. The Sydney system, which closed in 1961, was the most extensive and the largest passenger carrier of any Australian public transport system then or since, moving over 400 million passengers per annum, at its peak. Virtually all known types of motive power have been utilised at some stage, in Australia. Today, trams can be found in Melbourne (by length, the world's largest system), and to a lesser extent, Adelaide; all other major cities having largely dismantled their networks by the 1970s. Sydney reintroduced tram services in 1997 on a modern light rail network, while Ballarat and Bendigo retained their trams as heritage systems. In 2008 and 2009, Bendigo conducted trials utilising its heritage trams for regular public transport. Portland, Victoria, introduced a tourist tram in 1996 – this uses a former Melbourne cable car dummy and trailer car, but utilising a hidden diesel motor. A completely new public transport system opened on the Gold Coast, Queensland on 20 July 2014, with a major extension completed in December 2017. The new system is known as the G:link and is the first tram/ light rail system in the state of Queensland since Brisbane closed its tram network in 1969. Construction of light rail in Canberra. The development of light rail became a major issue in the 2016 ACT general elections.. The 2010s has also seen a significant expansion of Sydney's network, while the construction of light rail in Canberra became the major issue of the 2016 ACT election, with the ruling parties supporting the project and the opposition opposing it. The government was returned and Stage 1 of the light rail launched in April 2019. The railway into the centre of Newcastle was truncated to Wickham on 25 December 2014, The railway line was replaced by the Newcastle Light Rail line in February 2019. There are also loose plans for new systems in Hobart, Tasmania, and on the Sunshine Coast, Queensland. New Zealand's last public transport tramway system, that of Wellington, closed in 1966. Nevertheless, there had been tramways ranging from large, comprehensive systems to single lines, in Auckland, Christchurch, Dunedin, Gisborne, Invercargill, Napier, New Plymouth, Greymouth, Westport, Hokitika, Ross, Brighton, Charleston, Kamiere and Kamara. New Zealand's tram gauges were not standardised; the 15 systems used no less than five gauges, making swapping of rolling stock from system to system difficult. Christchurch has subsequently reintroduced heritage trams over a new CBD route, but the overhead wiring plus some track was damaged by the earthquake of 2011. In November 2013 a limited circuit was reopened. Auckland has recently introduced heritage trams into the Wynyard area, near the CBD, using former Melbourne trams. on 9 May 2018, two modern tram / Lightrail routes were announced from Wynyard Quarter, via Queen Street to Auckland Airport via Dominion Road and Onehunga in the South and via Queen Street and Great North Road, Point Chevalier and onto the Northwestern Motorway to Westgate to be running in the early 2020s with a possible further extension to Kumeu/Huapai. Preserved Auckland trams from the MOTAT have made cameo appearances during Heritage Weeks. Heritage lines exist at Auckland's MOTAT, the Wellington Tramway Museum at Queen Elizabeth Park on the Kapiti Coast, the Tramways Trust Wanganui and the Tramway Historical Society at Ferrymead in Christchurch, as well as the Christchurch Tramway Limited in the central city. Whangarei Steam and Model Railway Club also run two former Lisbon trams formally from Aspen, Colorado. PreMetro line E2 is a tram network that has operated in Buenos Aires since 1987. Buenos Aires in Argentina once had one of the most extensive tramway networks in the world with over 857 km (533 mi) of track, most of it dismantled during the 1960s in favour of bus transportation. A new line, the PreMetro line E2 system feeding the Line E of the Buenos Aires Subway has been operating since 1987 on the outskirts of Buenos Aires. In Cuenca, Ecuador, a tram line started operating since March 2019 as the main public transportation system in the city. The L1 of the Tranvia de Cuenca is 20.4 km long with 20 stops and uses Alstom Citadis (302) trains. In Medellín, Colombia, a tram line began operation on 15 October 2015, as a revival of old Ayacucho tram. The tram being raised from the river, a day after the disaster that saw it fall off an open drawbridge. In January 1864, well-known Anglo-Australian musician and composer Isaac Nathan was hit and killed by a Sydney horse tram when his clothing was caught in the door, whilst he was attempting to alight. Nathan is reputed to be one of the first tram fatalities in the Southern Hemisphere (many sources claim that it was the first such accident). On the morning of 18 August 1901, four masked men, described as "urban bushrangers", held up an eastbound horse tram in Riversdale Road, Melbourne, just past Power Street. For their trouble the men received £2.10.0 in fares from driver Thomas Taylor, and £21.19.0 from eight passengers. One passenger was injured. The bandits were never caught. Contemporary newspapers hypothesised that the bandits were after a specific commuter who travelled regularly on this particular tram and who was in the habit of carrying large amounts of cash. In the Tottenham Outrage in 1909, two armed robbers hijacked a tram and were chased by the police in another tram. On 7 June 1926 Catalan architect Antoni Gaudí was knocked down by a Barcelona tram and subsequently died. It is reputed that in the 1930s a murdered body was dragged out of the River Thames in London. The body had been stripped of anything that might have identified him. The only clue to the person's identity was a portion of a tram ticket hidden in the lining of his coat. The local police did not recognise the ticket but images in newspapers led to it being identified as a Melbourne tram ticket. Serendipitously, the serial number on the ticket was intact. Victoria Police in Melbourne, acting as agents for The Met in London, contacted the Melbourne & Metropolitan Tramways Board. From the serial number, the M&MTB were able to tell which tram depot had issued the ticket, on what day and on which specific tram, and in which section of a particular route (North Balwyn). Police then interviewed regular commuters and discovered the identity of a man whom, they believed, had recently travelled to London. This led to the arrest and conviction of the murderer. Decades after the event, the M&MTB were still citing the incident in training courses as a reason for tram conductors, etc., to keep proper and efficient records. A model of a town with a tram model built into it. Model trams are popular in HO scale (1:87) and O scale (1:48 in the US and generally 1:43,5 and 1:45 in Europe and Asia). They are typically powered and will accept plastic figures inside. Common manufacturers are Roco and Lima, with many custom models being made as well. The German firm Hödl and the Austrian Halling specialise in 1:87 scale. In the US, Bachmann Industries is a mass supplier of HO streetcars and kits. Bowser Manufacturing has produced white metal models for over 50 years. There are many boutique vendors offering limited run epoxy and wood models. At the high end are highly detailed brass models which are usually imported from Japan or Korea and can cost in excess of $500. Many of these run on 16.5 mm (0.65 in) gauge track, which is correct for the representation of 4 ft 8 1⁄2 in (1,435 mm) (standard gauge) in HO scale as in US and Japan, but incorrect in 4 mm (1:76.2) scale, as it represents 4 ft 8 1⁄2 in (1,435 mm). This scale/gauge hybrid is called OO scale. O scale trams are also very popular among tram modellers because the increased size allows for more detail and easier crafting of overhead wiring. In the US these models are usually purchased in epoxy or wood kits and some as brass models. The Saint Petersburg Tram Company produces highly detailed polyurethane non-powered O Scale models from around the world which can easily be powered by trucks from vendors like Q-Car. In the US, one of the best resources for model tram enthusiasts is the East Penn Traction Club of Philadelphia  and Trolleyville a website of the Southern California Traction Club. It is thought that the first example of a working model tramcar in the UK built by an amateur for fun was in 1929, when Frank E. Wilson created a replica of London County Council Tramways E class car 444 in 1:16 scale, which he demonstrated at an early Model Engineer Exhibition. Another of his models was London E/1 1800, which was the only tramway exhibit in the Faraday Memorial Exhibition of 1931. Together with likeminded friends, Frank Wilson went on to found the Tramway & Light Railway Society in 1938, establishing tramway modelling as a hobby. The 1993 ballet A Streetcar Named Desire is based on the play A Streetcar Named Desire. A Streetcar Named Desire was written by Tennessee Williams in 1947. The Australian play, Storming Mont Albert by Tram, is set on Melbourne tram route 42. Written by Paul Davies, it was first performed in February/March 1982 as part of Melbourne's Moomba festival. 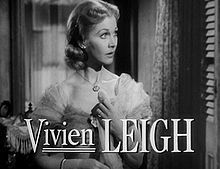 Vivien Leigh in the trailer for the 1951 film, A Streetcar Named Desire. Alfred Hitchcock was a well-known rail enthusiast with a particular interest in London trams. An overwhelming majority of his films include rail or tram scenes, in particular The Lady Vanishes, Strangers on a Train and Number Seventeen. Often, when the scene and take numbers appeared on a clapperboard during filming, Hitchcock would translate them into London tram route numbers; for example, if Scene 23, Take 2, appeared on the clapperboard, he was wont to whisper: "Woodford; Wimbledon" (the termini of Routes 23 and 2). Dziga Vertov's experimental 1929 film Man with a Movie Camera includes shots of trams (at 10 and 42 minutes). Black Orpheus (1959), has a lead character, Orfeu, who is a tram driver on Rio de Janeiro's tram system. The central plot of the film Who Framed Roger Rabbit involves Judge Doom, the villain, dismantling the streetcars of Los Angeles. Malcolm, is an Australian film about a tram enthusiast who uses his inventions to pull off a bank heist. There are many scenes of Melbourne trams, as well as models of Melbourne and Adelaide trams, and (at the end of the film) scenes showing Lisbon trams. Luis Buñuel filmed La Ilusión viaja en tranvía (English: Illusion Travels by Streetcar) in Mexico in 1953. In Akira Kurosawa's film Dodesukaden a mentally ill boy pretends to be a tram conductor. The Elephant Will Never Forget, is an 11-minute film made in 1953 by British Transport Films to celebrate the London tram network, at the time of its last few days of operation. Tramvaj (Tram) is an eight-minute,2012 Czech short animated film directed by Michaela Pavlátová. The 1953 British film, Genevieve is about vintage cars and, more particularly, the eccentricities of the car owners. The second part of the movie is about an unauthorised race between Brighton and Westminster Bridge by the film's two leads, played by John Gregson and Kenneth More. After many trials and tribulations, the hero (Gregson) eventually wins the race when the wheels of More's car gets stuck in the tram tracks and he moves in entirely the wrong direction, just before reaching the Bridge. There have been three film versions of A Streetcar Named Desire: in 1951, in 1984 and in 1995. The Herbie films are a series about a Volkswagen named Herbie. The second film, Herbie Rides Again, has tram 27 living in the garden, near to Herbie. 27 plays a major part in the plot of the film. 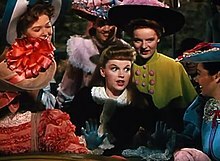 The 1944 film Meet Me in St. Louis includes Judy Garland singing The Trolley Song. Several films have been based on The Toonerville Trolley. "From time to time a strange vehicle drew near to the place where they stood—such a vehicle as the lady at the window, in spite of a considerable acquaintance with human inventions, had never seen before: a huge, low, omnibus, painted in brilliant colours, and decorated apparently with jingling bells, attached to a species of groove in the pavement, through which it was dragged, with a great deal of rumbling, bouncing, and scratching, by a couple of remarkably small horses." Published in 1878, the novel is set in the 1840s, though horse trams were not introduced in Boston till the 1850s. Note how the tram's efficiency surprises the European visitor; how two "remarkably small" horses sufficed to draw the "huge" tramcar. "Henrietta Stackpole was struck with the fact that ancient Rome had been paved a good deal like New York, and even found an analogy between the deep chariot-ruts traceable in the antique street and the overjangled iron grooves which express the intensity of American life." Horse-drawn trams in Amsterdam, c. 1900. The city's horse-drawn trams were highlighted in the novel The Mirror of the Sea. Joseph Conrad described Amsterdam's trams in chapter 14 of The Mirror of the Sea (1906): "From afar at the end of Tsar Peter Straat, issued in the frosty air the tinkle of bells of the horse tramcars, appearing and disappearing in the opening between the buildings, like little toy carriages harnessed with toy horses and played with by people that appeared no bigger than children." - I can't make out why the corporation doesn't run a tramline from the parkgate to the quays, Mr Bloom said. All those animals could be taken in trucks down to the boats. - Instead of blocking up the thoroughfare, Martin Cunningham said. Quite so. They ought to. - Yes, Mr Bloom said, and another thing I often thought is to have municipal funeral trams like they have in Milan, you know. Run the line out to the cemetery gates and have special trams, hearse and carriage and all. Don't you see what I mean? – O that be damned for a story, Mr Dedalus said. Pullman car and saloon diningroom. – A poor lookout for Corny [the undertaker], Mr Power added. – Why? Mr Bloom asked, turning to Mr Dedalus. Wouldn't it be more decent than galloping two abreast? In his fictionalised but autobiographical Memoirs of an Infantry Officer, published in 1930, Siegfried Sassoon's narrator ruminates from his hospital bed in Denmark Hill, London, in 1917 that "Even the screech and rumble of electric trams was a friendly sound; trams meant safety; the troops in the trenches thought about trams with affection." Danzig trams figure extensively in the early stages of Günter Grass's Die Blechtrommel (The Tin Drum). In the last chapter the novel's hero Oskar Matzerath and his friend Gottfried von Vittlar steal a tram late at night from outside Unterrath depot on the northern edge of Düsseldorf. In a surreal journey, von Vittlar drives the tram through the night, south to Flingern and Haniel and then east to the suburb of Gerresheim. Meanwhile, inside, Matzerath tries to rescue the half-blind Victor Weluhn (who had escaped from the siege of the Polish post office in Danzig at the beginning of the book and of the war) from his two green-hatted would-be executioners. Mazerath deposits his briefcase, which contains Sister Dorotea's severed ring finger in a preserving jar, on the dashboard "where professional motorman put their lunchboxes". They leave the tram at the terminus and the executioners tie Weluhn to a tree in von Vittlar's mother's garden and prepare to machine-gun him. But Matzerath drums, Weluhn sings, and together they conjure up the Polish cavalry, who spirit both victim and executioners away. Matzerath asks von Vittlar to take his briefcase in the tram to the police HQ in the Fürstenwall, which he does. The latter part of this route is today served by tram route 703 terminating at Gerresheim Stadtbahn station ("by the glassworks" as Grass notes, referring to the famous glass factory). In his 1967 spy thriller An Expensive Place to Die, Len Deighton misidentifies the Flemish coast tram: "The red glow of Ostend is nearer now and yellow trains rattle alongside the motor road and over the bridge by the Royal Yacht Club..."
In Funeral in Berlin the protagonist approaches Checkpoint Charlie driving "across the tram tracks of Zimmerstrasse that bump you into a world where 'communist' is not a dirty word". The Rev W. Awdry wrote about GER Class C53 called Toby the Tram Engine, which starred in his The Railway Series with his faithful coach, Henrietta. In Chrome Shelled Regios, a Japanese novel, trams are featured in the futuristic city of Zuelni. In Almonds and Raisins by Maisie Mosco, a novel about Jewish immigration to Manchester, England, from mainland Europe in the early twentieth century, the newly arrived Sanberg family see a tram for the first time – a Manchester double-decker. Abraham (the father) exclaims, "A train with two storeys? And no roof?" [Manchester trams were open-topped in those days.] The local rabbi explains: "In English, they call it a tram.... In Yiddish, we don't have a word for it." "In the wire overhead, there's electricity, we don't have a word for that either." The Chinese author Eileen Chang, who resided in Shanghai during the Second World War, incorporated the tram into her depiction of the urban lifestyle of the 1940s. As a city dweller, Eileen Chang explores the charms of the city landscape and how they affect her daily routine in her work ‘Notes on Apartment Life’, "... I can’t fall asleep until I hear the sound of streetcars". Judy Garland and the chorus performing The Trolley Song, a song inspired by a picture of a tram in a turn-of-the-century newspaper. "The Trolley Song" in the film Meet Me in St. Louis received an Academy Award nomination. The Stompin' Tom Connors song "To It And At It" mentions a man who "can't afford the train, he's sittin' on a streetcar, but he's eastbound just the same". And his song "TTC Skidaddler" makes reference to a TTC Streetcar driver: "I've been a streetcar driver now about eleven years and I know the old Toronto city well, There's a whole lotta people who wait along the track, For the signal from my clangin trolley bell...". Jens Lekman has a song titled "Tram No. 7 to Heaven", a reference to line 7 of the Gothenburg tram which passes through his native borough of Kortedala. The band Beirut has a song titled "Fountains and Tramways" on the EP Pompeii. In 2009 Thomas Haggerty composed and produced 'Tram' generations 1, 2 and 3 for the Slowcore/Indie Rock group, Tram. British rock band The Move recorded the song Turkish Tram Conductor Blues on their 1970 album Looking On. The 1995 opera A Streetcar Named Desire is based on the play A Streetcar Named Desire. The Neighbourhood Trolley. a model tram that is commonly featured on Mister Rogers' Neighbourhood. The US children's TV show Mister Rogers' Neighbourhood features a trolley (tram). It is shown on National Educational Television, PBS, Sprout and the Canadian Broadcasting Corporation. Trams feature in the opening titles of the world's longest running TV soap opera Coronation Street, set in a fictional suburb of Greater Manchester, and produced by Granada Television. A Blackpool tram killed one of the main characters in 1989 and the most recent faked accident involved a tram (modelled on the Manchester Metrolink) careering off a viaduct into the set in 2009. A porcelain plate with a lithograph of a tram, commemorating the first trams in Moscow and Nizhni Novgorod, in 1896–99. Tramway is a contemporary visual and performing arts venue located in the Scottish city of Glasgow. Based in the former Coplawill Glasgow Corporation Tramways depot in the Pollokshields area of the South Side, it consists of two performance spaces and two galleries, as well as offering facilities for community and artistic projects. It is claimed to be one of the leading venues of its type in Europe. A major feature of Spencer Street railway station, Melbourne from 1978 to 2005 was the giant Cavalcade of Transport mural, measuring 7 by 38 metres (23 by 125 ft). It was financed by the Victorian state government, and painted by Harold Freedman. It features all forms of transport used in Victoria from 1835 to 1978, with trams featuring prominently. A horizontal column of trams shows the progression of vehicle design, with some dozens of trams being illustrated. In 2000, during a revamp and renaming of the station to Southern Cross railway station, part of the mural was removed. It was taken down completely in 2005 and, after a cleaning, was in 2007 relocated to Spencer Outlet Centre, adjoining the railway station. A sculpture of tram 1040, the last numbered of Melbourne's iconic "W"-class trams was unveiled at the corner of Flinders and Spencer Streets, Melbourne, in October 2013. The sculpture is the work of local artist David Ball. It can be viewed from a number of tram routes, and is just one block from Southern Cross railway station. A Melbourne tram is featured in an Albert Tucker painting in his 1945 series Images of Modern Evil. The original is held in the collection of the National Gallery of Victoria. Toonerville Folks comic strip (1908–55) by Fontaine Fox featured the "Toonerville Trolley that met all the trains". In US baseball, the 1944 World Series was also known as the "Streetcar Series". The predominance of trams (trolleys) in the borough of Brooklyn in New York City gave rise to the disparaging term trolley dodger for residents of the borough. That term, shortened to "Dodger" became the nickname for the Brooklyn Dodgers (now the Los Angeles Dodgers). A representation of a Melbourne W-type tram featured at the opening ceremony of the 2006 Commonwealth Games in Melbourne. The "flying tram" (as it was dubbed) is now exhibited at the Melbourne Museum. Tramway, North Carolina, is an area of Lee County, North Carolina which politically forms part of Sanford. ^ "tram – definition". The Free Dictionary. Retrieved 19 February 2018. ^ "Online Etymology Dictionary". Etymonline.com. Archived from the original on 10 May 2015. Retrieved 8 March 2015. ^ Robert C. Post (2007). Urban Mass Transit: The Life Story of a Technology. Greenwood Publishing Group. p. 43. ISBN 978-0-313-33916-5. ^ "Online Etymology Dictionary". etymonline.com. Archived from the original on 12 September 2015. ^ Middleton, William D. (1967). The Time of the Trolley, p. 60. Milwaukee: Kalmbach Publishing. ISBN 0-89024-013-2. ^ Dunbar 1967, p. 15. ^ Dunbar 1967, p. 23. ^ Dunbar 1967, pp. 16–17. ^ a b Dunbar 1967, p. 18. ^ Dunbar 1967, p. 21. ^ "The Cable Car Home Page – Miscellaneous Newspaper Articles". www.cable-car-guy.com. ^ "Cinquant'anni fa Milano diceva addio al «Gamba de legn»". Retrieved 10 February 2019. ^ "Australian Timetable Association". austta.org.au. 10 August 2012. Retrieved 8 December 2012. ^ "Malaysia: first compressed natural gas tram in the world will be ready next year". www.ngvjournal.com. 22 February 2011. Archived from the original on 28 March 2012. ^ Hearst Magazines (May 1929). "Popular Mechanics". Popular Mechanics. Hearst Magazines. p. 750. ^ a b c Kaempffert & Martin 1924, pp. 122–123. ^ Fasting, Kåre: Sporveier i Oslo gjennom 100 år. AS Oslo Sporveier, Oslo 1975, pp. 49-50. ^ David E. Nye (1992). Electrifying America: Social Meanings of a New Technology, 1880–1940. MIT Press. p. 86. ISBN 978-0-262-64030-5. ^ a b "Taranna - Tasmania". The Sydney Morning Herald. Fairfax Media. 8 February 2014. Retrieved 23 February 2018. ^ "Local History - History of the Tasman Peninsula". Tasman Council. Retrieved 4 July 2015. ^ a b "Port Arthur Historic Sites Statutory Management Plan 2008". UNESCO. Retrieved 5 July 2015. ^ Robert Hughes (1987). The Fatal Shore. Random House. pp. 407–408. Retrieved 5 July 2015. ^ "Taranna - Tiny township on the road to Port Arthur". The Age. Fairfax Media. 8 February 2004. Retrieved 4 July 2015. ^ MBTA (2010). "About the MBTA-The "El"". MBTA. Archived from the original on 26 November 2010. Retrieved 8 December 2010. ^ "Transport Diversions Emporium – WEYMOUTH HARBOUR TRAMWAY". Transportdiversions.com. Archived from the original on 27 March 2014. Retrieved 8 March 2015. ^ a b c d "Destination City. Electric Rolling Stock of the Melbourne & Metropolitan Tramways Board", various editions, Australian Electric Traction Association, Melbourne. ^ "Delivering goods by cargo tram in Amsterdam (Netherlands) Eltis". www.eltis.org. Archived from the original on 20 August 2017. ^ a b Kings, Keith S. "Transcriptions of Preston Workshops Tramcar Record Cards", various pp. ^ Bain, George. "New Double-deck Streetcar – N.Y." Bain News Service. Archived from the original on 9 May 2015. ^ "Tramway Historical Society – Welcome". www.ferrymeadtramway.org.nz. Archived from the original on 6 April 2017. ^ a b Middleton, William D. (1967). The Time of the Trolley, pp. 93–97. Milwaukee: Kalmbach Publishing. ISBN 0-89024-013-2. ^ "GTT – Una breve storia dell'azienda dall'ATM ad oggi". Tramditorino.it. Archived from the original on 24 February 2015. Retrieved 8 March 2015. ^ "Tram hearse used in Newcastle, New South Wales". Government of New South Wales. Archived from the original on 6 April 2011. Retrieved 8 March 2015. ^ "Tram services to the Grand Prix ran smoothly and successfully again this year, despite a number of logging trucks that blocked Bourke Street services early on Thursday, 1st March" (PDF). www.yarratrams.com.au. Archived (PDF) from the original on 1 September 2007. Retrieved 8 March 2015. ^ "TRAM Power home | City Class Tram and LR55 rail system". Trampower.co.uk. Archived from the original on 15 February 2015. Retrieved 8 March 2015. ^ "ČVUT.cz – Čapek, Kolář" (PDF). Archived from the original (PDF) on 18 July 2011. Retrieved 12 May 2010. ^ "Tramwaje Warszawskie – wagon-żłobek". Tramwar.republika.pl. Archived from the original on 10 May 2013. Retrieved 8 December 2012. ^ "Tramwaj-żłobek dowoził tylko maluchy do żłobka MPK". Wroclaw.gazeta.pl. Archived from the original on 14 September 2012. Retrieved 8 December 2012. ^ Zhantaykyzy, Maral (10 December 2016). "Almaty's Tram Café Is Favourite Ride for Romance". Astana Times. Archived from the original on 2 March 2017. Retrieved 10 December 2016. ^ "Sightseeing in Frankfurt with the Ebbelwei-Express". Verkehrsgesellschaft Frankfurt am Main. Archived from the original on 11 June 2012. Retrieved 14 March 2013. ^ "Retrieved 21 September 2013". ^ Porto:Metro from NYCsubway.org. Retrieved 15 February 2009. ^ Georges Dobias, "Urban Transport in France" Archived 11 October 2017 at the Wayback Machine Japan Railway & Transport Review, 16 June 1998. Retrieved 15 February 2009. ^ Dualis extends the reach of the Citadis family Archived 21 December 2009 at the Wayback Machine, Railway Gazette International, 2 June 2007. Retrieved 15 February 2009. ^ "An Introduction To Capacitors". Facstaff.bucknell.edu. Archived from the original on 9 March 2015. Retrieved 8 March 2015. ^ Allez le Tram from Railway-Technology.com. Retrieved 15 February 2009. ^ "Human Transit". Human Transit. Archived from the original on 31 March 2015. ^ "Special Report 257: Making Transit Work" (PDF). Archived (PDF) from the original on 8 August 2017. Retrieved 12 March 2017. ^ "Why are trams different from buses from Trams for Bath". Bathtram.org. Archived from the original on 8 June 2013. Retrieved 8 December 2012. ^ a b "Crossing tram tracks – Bicycle Network". Bv.com.au. 14 July 2004. Archived from the original on 31 March 2012. Retrieved 8 December 2012. ^ "Trams/Light Rail – Road Safety Authority Rules of the Road". Rulesoftheroad.ie. Archived from the original on 29 November 2007. Retrieved 8 December 2012. ^ Andrew Heasley (29 April 2004). "Slippery issue on track". The Sydney Morning Herald.drive.com.au. Archived from the original on 8 November 2012. Retrieved 8 December 2012. ^ Charles S. McCaleb, Rails, Roads & Runways: The 20-Year Saga of Santa Clara County's Transportation Agency, (San Jose: Santa Clara County Transportation Agency, 1994), 67. Besides recounting statistics and anecdotes, this source also reprints a San Jose Mercury News cartoon of one such accident, in which a bemused tow truck driver quips, "Dang! Rod Diridon was right! The trolley does reduce the number of vehicles on the road!" ^ "Light Rail Service: Pedestrian and Vehicular Safety | Blurbs | Main". Trb.org. 30 March 2014. Archived from the original on 1 June 2008. Retrieved 8 March 2015. ^ "Wheel/Rail Noise Control Manual | Blurbs | Main". Trb.org. Archived from the original on 1 June 2008. Retrieved 8 March 2015. ^ "Musée des Transports Urbains – Histoire – Histoire Générale des Transports Urbains". Amtuir.org. Archived from the original on 19 March 2015. Retrieved 8 March 2015. ^ Keenan, Edward (14 September 2015). "Streetcars are our neglected stars". The Toronto Star. Torstar Corporation. Archived from the original on 15 September 2015. ^ Hume, Christopher (14 September 2015). "Toronto rides new streetcars to its urban future". The Toronto Star. Torstar Corporation. Archived from the original on 9 September 2014. ^ a b "World Tramways". tundria.com. Archived from the original on 5 May 2016. ^ Sandi, Gabor. "Melbourne 2014". Archived from the original on 25 April 2017. Retrieved 12 March 2017. ^ "UrbanRail.Net > Europe > Russia> St. Petersburg Tram". Archived from the original on 23 February 2017. Retrieved 12 March 2017. ^ Sandi, Gabor. "BERLIN POTSDAM 2016". Archived from the original on 6 July 2017. Retrieved 12 March 2017. ^ Sandi, Gabor. "Moscow 2016". Archived from the original on 20 August 2017. Retrieved 12 March 2017. ^ Sandi, Gabor. "Budapest 2016". Archived from the original on 20 August 2017. Retrieved 12 March 2017. ^ "UrbanRail.Net > Europe > Poland > Katowice Tram". Archived from the original on 8 February 2017. Retrieved 12 March 2017. ^ "UrbanRail.Net > Europe > Austria > WIEN (Vienna) Straßenbahn – Tram". Archived from the original on 21 January 2017. Retrieved 12 March 2017. ^ Schwandl, Robert. "UrbanRail.Net > USA > Dallas Light Rail & Streetcar (DART)". Archived from the original on 13 March 2017. Retrieved 12 March 2017. ^ "Dallas M-Line (McKinney Avenue Streetcar)". Archived from the original on 10 March 2017. Retrieved 12 March 2017. ^ Sandi, Gabor. "Leipzig 2015". Archived from the original on 6 July 2017. Retrieved 12 March 2017. ^ "UrbanRail.Net > Europe > Poland > Łódź Tram". Archived from the original on 1 March 2017. Retrieved 12 March 2017. ^ "UrbanRail.Net > Europe > Romania > BUCHAREST Tram". Archived from the original on 23 March 2017. Retrieved 12 March 2017. ^ o., Dopravní podnik hlavního města Prahy, WDF – Web Design Factory, s. r. "dpp.cz > Company Profile – Dopravní podnik hlavního města Prahy". Archived from the original on 19 February 2017. Retrieved 12 March 2017. ^ Sandi, Gabor. "Los Angeles 2016". Archived from the original on 19 March 2017. Retrieved 12 March 2017. ^ "UrbanRail.Net > Europe > Germany > STUTTGART Stadtbahn". Archived from the original on 2 March 2017. Retrieved 12 March 2017. ^ Sandi, Gabor. "Paris 2016". Archived from the original on 25 October 2016. Retrieved 12 March 2017. 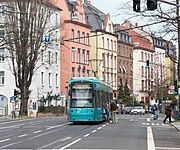 ^ "UrbanRail.Net > Europe > Germany > Mannheim Straßenbahn (Tram)". Archived from the original on 2 March 2017. Retrieved 12 March 2017. ^ "UrbanRail.Net > Europe > Germany > Ludwigshafen Straßenbahn (Tram)". Archived from the original on 19 May 2017. Retrieved 12 March 2017. ^ Sandi, Gabor. "Cracow 2015". Archived from the original on 18 August 2017. Retrieved 12 March 2017. ^ Sandi, Gabor. "Zürich 2011". Archived from the original on 30 October 2016. Retrieved 12 March 2017. ^ "UrbanRail.Net > North America > Canada > Ontario > Toronto Streetcar (Tram)". Archived from the original on 1 December 2016. Retrieved 12 March 2017. ^ "Transport in figures". GVB. Archived from the original on 26 September 2011. Retrieved 27 September 2013. ^ Sandi, Gabor. "MUNICH 2013". Archived from the original on 6 July 2017. Retrieved 12 March 2017. ^ Sandi, Gabor. "Antwerp 2015". Archived from the original on 18 August 2017. Retrieved 12 March 2017. ^ "UrbanRail.Net > Europe > Netherlands > ROTTERDAM Tram". Archived from the original on 4 April 2017. Retrieved 12 March 2017. ^ Schwandl, Robert. "UrbanRail.Net > USA > Sacramento Light Rail". Archived from the original on 2 February 2017. Retrieved 12 March 2017. ^ Sandi, Gabor. "Lyon 2016". Archived from the original on 20 August 2017. Retrieved 12 March 2017. 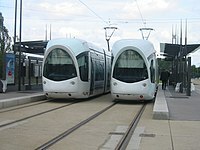 ^ "UrbanRail.Net > Europe > France > Montpellier Tram". Archived from the original on 23 February 2017. Retrieved 12 March 2017. ^ "Tramway – Montpellier Méditerranée Métropole". Archived from the original on 19 December 2016. Retrieved 12 March 2017. ^ a b Sandi, Gabor. "San Francisco 2007". Archived from the original on 15 March 2017. Retrieved 12 March 2017. ^ "Archived copy" (PDF). Archived from the original (PDF) on 4 November 2013. Retrieved 2 November 2013. CS1 maint: Archived copy as title (link). ^ "UrbanRail.Net > Europe > Italy > MILANO (Milan) Tram". Archived from the original on 6 May 2017. Retrieved 12 March 2017. ^ Sandi, Gabor. "Milan 2015". Archived from the original on 20 August 2017. Retrieved 12 March 2017. ^ a b Sandi, Gabor. "DÜSSELDORF 2016". Archived from the original on 6 July 2017. Retrieved 12 March 2017. ^ "UrbanRail.Net > Europe > Netherlands > Den Haag Tram & RandstadRail". Archived from the original on 4 April 2017. Retrieved 12 March 2017. ^ Sandi, Gabor. "Den Haag – The Hague 2016". Archived from the original on 20 August 2017. Retrieved 12 March 2017. ^ "UrbanRail.Net > Europe > France > Strasbourg Tram". Archived from the original on 21 December 2016. Retrieved 12 March 2017. ^ "Home – CTS : Compagnie des Transports Strasbourgeois". Archived from the original on 13 March 2017. Retrieved 12 March 2017. ^ Sandi, Gabor. "Calcutta 2015". Archived from the original on 20 August 2017. Retrieved 12 March 2017. ^ "UrbanRail.Net > Asia > India > West Bengal > Kolkata (Calcutta) Tram". Archived from the original on 25 March 2017. Retrieved 12 March 2017. ^ "Providing Public Transportation Alternatives for the Greater Phoenix Metro Area – Valley Metro – Press Releases". Archived from the original on 26 February 2017. Retrieved 12 March 2017. ^ Sandi, Gabor. "Phoenix 2005". Archived from the original on 19 March 2017. Retrieved 12 March 2017. ^ Sandi, Gabor. "Paris 1930". Archived from the original on 6 August 2017. Retrieved 12 March 2017. ^ "Welcome to the Shore Line Interurban Historical Society | Chicago Surface Lines". Shore-line.org. Archived from the original on 2 April 2015. Retrieved 8 March 2015. ^ Sandi, Gabor. "Rio de Janeiro 1958". Archived from the original on 6 August 2017. Retrieved 12 March 2017. ^ Sandi, Gabor. "Minneapolis – St. Paul 1947". Archived from the original on 19 March 2017. Retrieved 12 March 2017. ^ "Works starts on China's first modern tram line in Suzhou". City of Suzhou. 13 September 2012. Archived from the original on 21 September 2013. Retrieved 19 September 2013. ^ "Bangkok Tram City Night Tour : Bangkok Tourist Attractions". Bangkoktram.com. Archived from the original on 5 March 2015. Retrieved 8 March 2015. ^ "Transit Ridership Report: Third Quarter 2015" (PDF). American Public Transportation Association. 30 November 2015. Archived (PDF) from the original on 31 January 2016. Retrieved 21 January 2016. ^ Tess Kalinoski (8 September 2014). "TTC's Spadina launch inspires streetcar envy on other lines". Toronto Star. Archived from the original on 9 September 2014. Retrieved 8 September 2014. Normally, the Bombardier plant produces one light rail vehicle (LRV) every three weeks, said spokesperson Marc Laforge. That's not happening while a strike at the company's Thunder Bay plant is in its eighth week. Once production resumes, however, Bombardier can accelerate its schedule to three LRVs a month. The two sides are back in bargaining, and Bombardier will discuss a revised delivery schedule with the TTC, he said. ^ Christopher Hume (1 September 2014). "Toronto rides new streetcars to its urban future: Hume Getting there will be half the fun now that Toronto's new streetcars are in service". Toronto Star. Archived from the original on 9 September 2014. Retrieved 8 September 2014. Seeing these beautiful behemoths rolling through Toronto might force us to reconsider the complaint heard over and over that streetcars are forever in the way. Once all 204 new vehicles have been deployed in four or five years, they will be the undisputed masters of the streets; it will be cars that will have to make way. ^ Kim Brown (31 August 2014). "New TTC streetcars make their debut". Toronto Star. Archived from the original on 1 September 2014. Retrieved 8 September 2014. Torontonians taking the Spadina streetcar might have noticed something different when they stepped on board today. That's because the Toronto Transit Commission has finally launched the first of its new streetcars. ^ National Post Staff (27 September 2012). "Next-generation streetcars arrive in Toronto for trials". National Post. Archived from the original on 30 January 2013. Retrieved 31 October 2012. ^ Taplin, M. R. (October 2001). "Return of the (modern) streetcar: Portland leads the way". Tramways & Urban Transit. Hersham, Surrey, UK: Ian Allan Publishing Ltd. ISSN 1460-8324. Archived from the original on 27 September 2013. Retrieved 3 May 2014. ^ "Results – ABC News (Australian Broadcasting Corporation)". Archived from the original on 9 March 2017. Retrieved 12 March 2017. ^ "Thanks for joining us to launch the Light Rail". Transport Canberra. Retrieved 23 April 2019. ^ New era for Newcastle Archived 26 December 2014 at the Wayback Machine Transport for NSW 26 December 2014. ^ New Zealand used the following gauges: 1,435 mm (4 ft 8 1⁄2 in) standard gauge, 1,422 mm (4 ft 8 in), 4 ft (1,219 mm), 1,067 mm (3 ft 6 in), 914 mm (3 ft). ^ "Mendoza light rail service begins" (December 2012). Tramways & Urban Transit, p. 451. LRTA Publishing. ISSN 1460-8324. ^ "Ayacucho Tram Begins Operation, Metro de Medellin Discuss Further Expansion Plans « Metro Americas". 15 October 2015. Archived from the original on 25 February 2017. Retrieved 12 March 2017. ^ "Medellín: Ayacucho tram will begin service in 2015". www.metroamericas.com. 18 March 2015. Archived from the original on 4 September 2015. Retrieved 5 August 2015. ^ Morrison, Allen. "The trams and trolleybuses of Medellín, Colombia". Electric Transport in Latin America. Archived from the original on 8 December 2015. Retrieved 8 January 2016. Mr. Nathan was a passenger by No. 2 tramway car [...] [he] alighted from the car at the southern end, but before he got clear of the rails the car moved onwards [...] he was thus whirled round by the sudden motion of the carriage and his body was brought under the front wheel. ^ David Crowden, Isaac Nathan: the Biographical Puzzle: Part One - article in Australian Jewish Historical Society Journal, Volume XXIII Part 4, June 2018, AJHS Sydney. ^ "Friends of Hawthorn Tram Depot: Melbourne's horse trams". Hawthorntramdepot.org.au. Archived from the original on 1 March 2015. Retrieved 8 March 2015. ^ "19 Aug 1901 – A DARING RAID. ROBBERY UNDER ARMS. TRAMCAR STUCK..." Nla.gov.au. Retrieved 8 March 2015. ^ "Tottenham Outrage". www.londonremembers.com. Retrieved 21 April 2018. ^ "Biography of Antoni Gaudi". casabatllo.es. Retrieved 21 April 2018. ^ "Auto-Modellbahn-Welt Hödl Straßenbahn und Oldtimertram Modelle". Hoedl-linie8.de. Archived from the original on 22 February 2015. Retrieved 8 March 2015. ^ "Straßenbahnmodelle, Eisenbahnmodelle, Werkzeugbau und Konstruktionsbüro Leopold Halling". Halling.at. 25 February 2015. Archived from the original on 2 April 2015. Retrieved 8 March 2015. ^ "Marktübersicht – Straßenbahnen – Straßenbahnfreunde Hemer". Strassenbahnfreunde-hemer.de. Archived from the original on 2 April 2015. Retrieved 8 March 2015. ^ "Home HO O N S New Products Price List Miscellaneous Join Email List Dealer Orders Retail Orders Contact". Bowser-trains.com. 1 May 1961. Archived from the original on 12 June 2002. Retrieved 8 March 2015. ^ "St.-Petersburg Tram Collection". Sptc.spb.ru. Archived from the original on 18 December 2014. Retrieved 8 March 2015. ^ "Main". Q-Car Company. Archived from the original on 13 March 2015. Retrieved 8 March 2015. ^ "East Penn Traction Club – Home Page". Eastpenn.org. Archived from the original on 22 February 2015. Retrieved 8 March 2015. ^ "A Warm Welcome to Trolleyville!". Trolleyville.com. Archived from the original on 2 March 2015. Retrieved 8 March 2015. ^ "Tramway & Light Railway Society". Tramwayinfo.com. Archived from the original on 2 April 2015. Retrieved 8 March 2015. ^ Patrick McGilligan, 2003. Buckley, R. J. 1984. Alfred Hitchcock: A Life in Darkness and Light (ISBN 0-470-86973-9). Chichester, UK, John Wiley & Sons Ltd.
^ "Ryco : welkom". Ryco.be. Archived from the original on 6 November 2015. Retrieved 8 March 2015. ^ p. 28, Triad edition, 1978. ^ p. 84, Vintage Books edition. ^ "Almonds and Raisins". Archived from the original on 20 October 2016. Retrieved 12 March 2017. ^ "Glasgow Museums". glasgowmuseums.com. Archived from the original on 20 January 2008. ^ "Southern Cross 'Cavalcade of Transport' mural takes back door to shopping centre progress". The Age. Archived from the original on 16 October 2015. ^ "David Ball : Resume" (PDF). Davidmitchelbell.com. Archived (PDF) from the original on 16 April 2015. Retrieved 8 March 2015. ^ "Iconic W-class tram up-ended at Melbourne intersection – in the name of art". Heraldsun.com.au. Retrieved 8 March 2015. ^ "Heide Museum of Modern Art" (PDF). heide.com.au. Archived from the original (PDF) on 21 March 2012. ^ "The Flying Tram". museumvictoria.com.au. Archived from the original on 10 March 2011. Dunbar, Chas.S. (1967). Buses, Trolleys & Trams. London: Octopus Publishing Group. ISBN 978-0-7537-0970-2. Malone, Dumas (1928). Sidney Howe Short. Dictionary of American Biography. 17. London, UK; New York, USA: Charles Scribner's Sons. Retrieved 31 May 2017. Arrivetz, Jean. 1956. Les Tramways Français (No ISBN). Lyon: Editions Omni-Presse. Bett, W. C., and J. C. Gillam. 1962. Great British Tramway Networks (4th Edition), ISBN 0-900433-03-5. London: Light Railway Transport League. Brimson, Samuel. 1983. The Tramways of Australia (ISBN 0-949825-01-8). Sydney: Dreamweaver Books. Buckley, R. J. 1984. Tramways and Light Railways of Switzerland and Austria (ISBN 0-900433-96-5). Milton Keynes, UK: Light Rail Transit Association. Chandler, Allison. 1963. Trolley Through the Countryside (No ISBN). Denver: Sage Books. Davies, W. K. J. 1986. 100 years of the Belgian vicinal: SNCV/NMVB, 1885–1985: a century of secondary rail transport in Belgium (ISBN 0-900433-97-3). Broxbourne, UK: Light Rail Transit Association. Dyer, Peter, and Peter Hodge. 1988. Cane Train: The Sugar-Cane Railways of Fiji (ISBN 0-908573-50-2). Wellington: New Zealand Railway and Locomotive Society Inc.
Gragt, Frits van der. 1968. Europe's Greatest Tramway Network (No ISBN). Leiden, Netherlands: E.J. Brill. Hilton, George W. 1997. The Cable Car in America: A New Treatise upon Cable or Rope Traction As Applied to the Working of Street and Other Railways, Revised Edition (ISBN 0-8047-3051-2). Stanford (CA), US: Stanford University Press. Howarth, W. Des. 1971. Tramway Systems of Southern Africa (No ISBN). Johannesburg: published by the author. King, B. R., and J. H. Price. 1995. The Tramways of Portugal (4th Edition) (ISBN 0-948106-19-0). London: Light Rail Transit Association. Middleton, William D. 1967. The Time of the Trolley (ISBN 0-89024-013-2). Milwaukee (WI), US: Kalmbach Publishing. Morrison, Allen. 1989. "The Tramways of Brazil: A 130-Year Survey" (ISBN 0-9622348-1-8). New York: Bonde Press. Morrison, Allen. 1992. The Tramways of Chile: 1858–1978 (ISBN 0-9622348-2-6). New York: Bonde Press. Morrison, Allen. 1996. Latin America by Streetcar: A Pictorial Survey of Urban Rail Transport South of the U.S.A. (ISBN 0-9622348-3-4). New York: Bonde Press. Pabst, Martin. 1989. Tram & Trolley in Africa (ISBN 3-88490-152-4). Krefeld: Röhr Verlag GMBH. Peschkes, Robert. World Gazetteer of Tram, Trolleybus, and Rapid Transit Systems. Part One, Latin America (ISBN 1-898319-02-2). 1980. Exeter, UK: Quail Map Company. Part Two, Asia+USSR / Africa / Australia (ISBN 0-948619-00-7). 1987. London: Rapid Transit Publications. Part Three, Europe (ISBN 0-948619-01-5). 1993. London: Rapid Transit Publications. Part Four, North America (ISBN 0-948619-06-6). 1998. London: Rapid Transit Publications. Röhr, Gustav. 1986. Schmalspurparadies Schweiz, Band 1: Berner Oberland, Jura, Westschweiz, Genfer See, Wallis (ISBN 3-921679-38-9). Aachen: Schweers + Wall. Rowsome, Frank; Stephan McGuire, tech. ed. (1956). A Trolley Car Treasury: A Century of American Streetcars—Horsecars, Cable Cars, Interurbans, and Trolleys. New York: McGraw-Hill. Schweers, Hans. 1988. Schmalspurparadies Schweiz, Band 2: Nordostschweiz, Mittelland, Zentralschweiz, Graubünden, Tessin (ISBN 3-921679-46-X). Aachen: Schweers + Wall. Stewart, Graham. 1985. When Trams Were Trumps in New Zealand (OCLC 12723934). Wellington: Grantham House Publishing. Stewart, Graham. 1993 The End of the Penny Section (revised and enlarged edition) (ISBN 1-86934-037-X). Wellington: Grantham House Publishing. Straßenbahnatlas ehem. Sowjetunion / Tramway Atlas of the former USSR (ISBN 3-926524-15-4). 1996. Berlin: Arbeitsgemeinschaft Blickpunkt Straßenbahn, in conjunction with Light Rail Transit Association, London. Straßenbahnatlas Rumänien (compiled by Andreas Günter, Sergei Tarknov and Christian Blank; ISBN 3-926524-23-5). 2004. Berlin: Arbeitsgemeinschaft Blickpunkt Straßenbahn. Tramway & Light Railway Atlas: Germany 1996 (ISBN 0-948106-18-2). 1995. Berlin: Arbeitsgemeinschaft Blickpunkt Straßenbahn, in conjunction with Light Rail Transit Association, London. Turner, Kevin. 1996. The Directory of British Tramways: Every Passenger-Carrying Tramway, Past and Present (ISBN 1-85260-549-9). Somerset, UK: Haynes. Waller, Michael H., and Peter Walker. 1992. British & Irish Tramway Systems since 1945 (ISBN 0-7110-1989-4). Shepperton (Surrey), UK: Ian Allan Ltd.
Wikimedia Commons has media related to Trams. Look up tram in Wiktionary, the free dictionary. Garcke, Emile (1911). "Tramway" . In Chisholm, Hugh (ed.). Encyclopædia Britannica. 27 (11th ed.). Cambridge University Press. pp. 159–167. "Street Railway" . New International Encyclopedia. 1905.